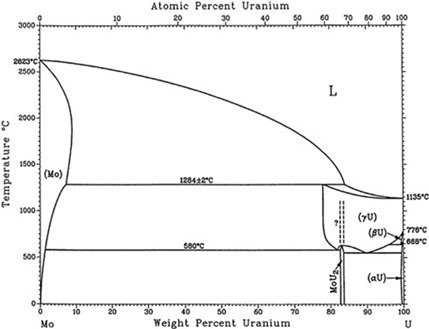 Pure uranium and various alloys of uranium that exist in the orthorhombic α-phase are poor performers under irradiation due to anisotropic growth that induces grain-boundary tearing and resultant breakaway swelling. The high temperature γ-phase is more resistant to thermal cycling and irradiation damage because of the isotropic nature of this phase. The composition and temperature range over which the α, β and γ phase remain stable can be altered by alloying of uranium. From all possible transition metals, Molybdenum is the best compromise because γ-U with Mo in solid solution possesses acceptable irradiation stability, mechanical properties and corrosion resistance. Unfortunately, Mo has a non-negligible parasitic absorption cross-section for neutrons (2.6 b). U-Mo alloys (U(Mo)) containing at least 2.94 wt% or 7 at% Mo retain the γ structure upon quenching. Although the stability of the U(Mo) γ-phase will increase with the amount of Mo, the maximum concentration of Mo in U(Mo) to be used as LEU fuel should be limited to 10 wt% Mo as otherwise the required high U density criterion is not met.